Services (USCIS) office asks for additional information that will supplement the application of an H-1B visa. One of these supplemental documents can be in the form of a business plan. 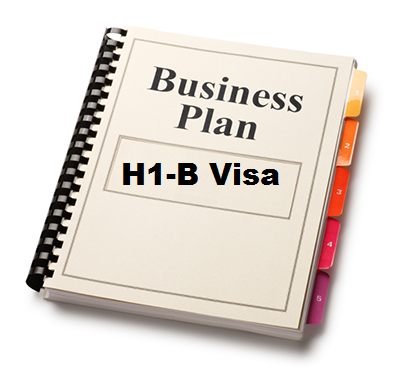 A professional Visa business plan writer will increase the chances of an approved application with the USCIS office. determine if they meet the eligibility requirements. occupation must be related to the bachelor's degree or education that the applicant has obtained. Requirement #4 states that the applicant must be paid at least the actual or prevailing wage for the occupation; whichever is higher. And requirement #5 states that an H-1B Visa number must be available at the time of the filing of the petition, unless the position is exempt numerical limits. Currently in the United States government only allows 65,000 Visas for the H-1B classification per fiscal year. applicant. Proving that the degree is related to a specialty occupation and that the visa application is indeed working in a specialty occupation upon the arrival within the United States, the business plan should state the occupation and how the applicant is uniquely qualified for the job within the United States. The financial projections should also state the wages the visa applicant will be paid and this wage should be higher or equal to the prevailing wage that is normally paid for a similar occupation . be taken to ensure that the business plan reader understands that the occupation that will be held by the applicant is extremely specialized.